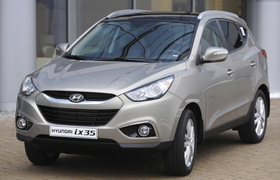 Kia made about 70,000 units of the Hyundai ix35 in Slovakia this year. BRATISLAVA (Reuters) -- South Korean carmaker Kia Motors Corp. will boost car production in Slovakia by 40 percent this year, driven mainly by rising demand in the SUV market, the company's Slovak unit said on Wednesday. Kia Motors Slovakia CEO In-Kyu Bae told journalists it planned to boost production at its Slovak site to 210,000 cars. Engine production should rise to 300,000 units in 2010, up from 243,000 units last year. "The SUV market in Europe is going up ... and we want to increase our market share," Bae said, when presenting the new ix35 SUV built for sister brand Hyundai. Kia made about 70,000 ix35s in Slovakia this year.